Several Norwegian kings have been named Magnus. Tomorrow there will another, when grandmaster Magnus Carlsen becomes the highest rated player in the world. Here is an article from Reuters on the new king of chess. 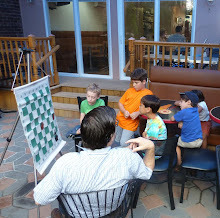 Here are ten photos from Sunday's quads at the new Dean Of Chess Academy. I took the first three. 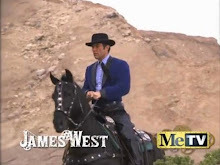 The remaining seven were taken by Steve Ferrero and Dawn Ippolito, using Steve's camera. 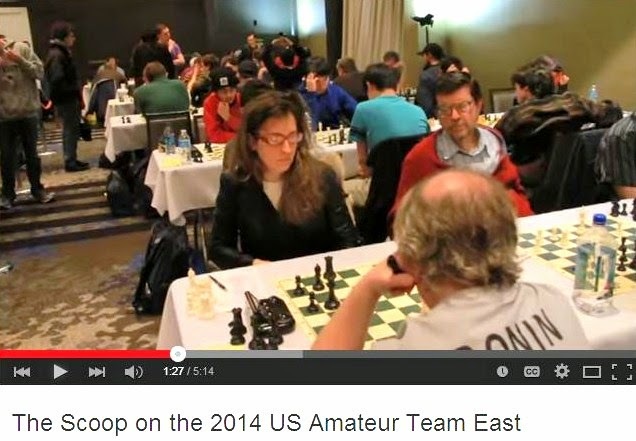 Meanwhile, Dean Ippolito was winning his first four games at the Eastern Open in Washington DC. 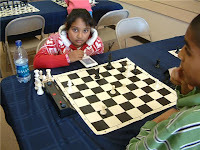 The New York Times had a recent article about women's chess in Tucson, where Alexandra Kosteniuk gave a simultaneous exhibition. 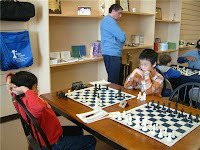 There were no quiet draws for me, in Sunday's game/90 quads, at the new Dean of Chess Academy. All three games were hard fought. 65.Rd7 Re5 66.Rxe7 Bxe7 67.Kxe7 Rxf5 68.Kd6 Rf1 69.e7 Rd1+ 70.Ke6 Re1+ 71.Kd7 Rd1+ 72.Ke6 Re1+, draw. 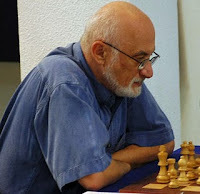 47.g4 Bxa3 48.Kxe3 Kb6 49.Ke4 Kxb5 50.g5 Bb2 51.g6 Kc6 52.g7 Bxg7, draw. 35.Rd1 Nf4 36.Bxf4+ gxf4 37.Rh1 e3 38.Rh7+ Kc8 39.fxe3 fxe3 40.Kc3 e2 41.Kd2 Bc4 42.c6 bxc6 43.bxc6 Bxd4 44.Re7 Bf2 45.Rxe2 Bxe2 46.Kxe2 Bb6 47.Kd3 Kc7 48.Kc4 Kxc6, draw. 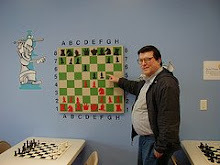 More than 50 players showed up for yesterday's game/60 Swiss at the Marshall Chess Club, where my final score was 3-1-0. 27.Qf4 e5 28.Qxe5 Qxe5 29.dxe5 Kf7 30.Bh3 a3 31.Bf1 Ke6 32.Kf2 Kxe5, White resigns. Magnus Carlsen Interview in "Time"
GM Magnus Carlsen, who will soon be number one on the FIDE rating list, is interviewed in Time magazine. 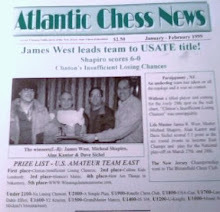 Barnes - Morphy on "YouTube"
I had the following game in mind when I played the PCG against Steven Sinding at the USATE 2000. Here is a review, from Art in America magazine, of Guido van der Werve's Nummer twaalf. In response to Friday's post about Russell Crowe and Ben Affleck starring in the movie version of Bobby Fischer Goes to War, blogger Michael Goeller of The Kenilworthian has sent me an e-mail. He writes that the article in the Sun Star Cebu is "poorly researched and has its facts wrong." Goeller thinks that their journalist "misread this news item." One point in Goeller's favor is that the Sun Star Cebu got director Kevin Macdonald's first name wrong and misspelled his last name. 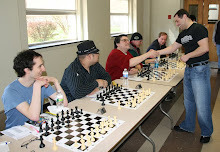 These pictures were taken by me on Sunday, the final day of the Marshall Chess Club championship. 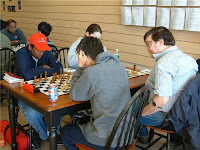 The tournament was won by IM Alex Lenderman, who earned his fourth GM norm. 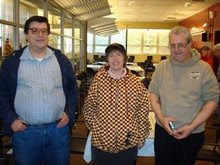 Sunday was the final day of the Marshall Chess Club championship, won by GM-elect Alex Lenderman. I had a quick win in the last round. 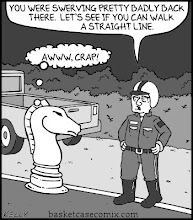 10.Ne5 Bxg2 11.Kxg2 d6 12.Nd3 Bxc3 13.Bxc3 Nbd7 14.f3 e5 15.Qc2 Rae8 16.Rae1 e4 17.Nf2 Rf7 18.Bb2 exf3+ 19.exf3 Qxe1 20.Rxe1 Rxe1 21.Qxf5 Re2 22.Qb1 Ng4, White resigns. 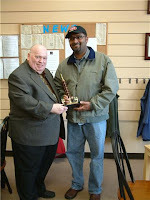 For players like me in the four day schedule, yesterday was day three of the Marshall Chess Club championship. 29.Nxd6 cxd6 30.Rc8 Kf8 31.Rxd8+ Ke7 32.Rb8 Rc7 33.Rxb6 Rc1+ 34.Kf2 Rc2+ 35.Kf1 Rc1+ 36.Kf2 Rc2+ 37.Kf1, draw. Atomic Patzer has sent me an e-mail, advising that today's quads in Hamilton have been cancelled because of the predicted snow storm. 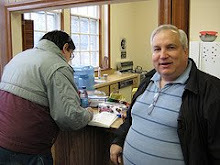 You might want to contact TD Ed Sytnik at his cell phone number 609-351-2437 before driving to Hamilton. According to an article in Sun Star Cebu, Russell Crowe and Ben Affleck will star in the movie version of Bobby Fischer Goes to War. 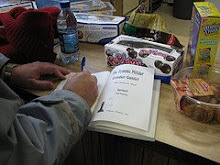 Yesterday, astronaut Greg Chamitoff resigned his game against Earth. Here is the final position. Chamitoff had the white pieces. Recently, GM-elect Alex Lenderman has been almost perfect. 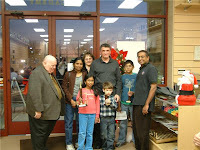 In late November, Lenderman won the National Chess Congress 2009 in Philadelphia on tie-breaks. 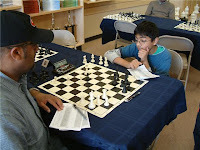 A week later, he won the ICA Early Winter 2009 Open in Hackensack, with a 4-0 record. 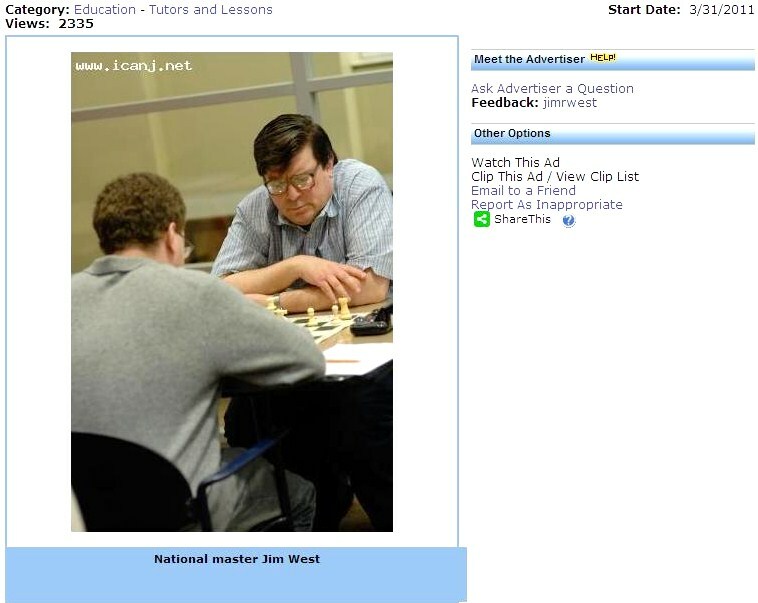 Now, after the first weekend of the Marshall Chess Club championship, he leads the tournament at 5-0. Lenderman is still a GM-elect because FIDE is undecided whether to accept one of his three GM norms where it appears that last-round pairings, not involving Alex, were made to favor players seeking norms. 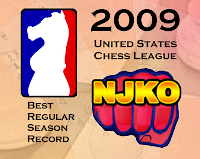 GM Boris Gulko and IM Dean Ippolito are 2009 Board Two All Stars, on the first and second teams respectively, in the United States Chess League. They play for the New Jersey Knockouts, who finished with the best record in the league this year. 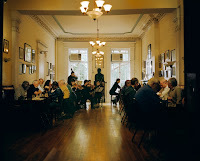 These photos were taken by me during the first weekend of the Marshall Chess Club championship. 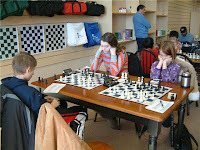 This 86-move marathon was the last game to finish tonight at the Marshall Chess Club championship. 70.Kf2 Ke4 71.Ke2 Kd4 72.Kf3 Ke5 73.Kf2 Kf5 74.Kf3 Kg5 75.Kf2 Kg4 76.Kg2 f3+ 77.Kf2 Kf4 78.Kf1 Kg3 79.Kg1 Kg4 80.Kf2 Kf4 81.Kf1 Ke3 82.Ke1 Kd3 83.Kf2 Ke4 84.Kf1 Ke3 85.Ke1 f2+ 86.Kf1 Kf3, stalemate.